joel mayward: Monday Movie Day Reviews: Oops! Monday Movie Day Reviews: Oops! I definitely forgot that I had seen the recent release Traitor this weekend! Maybe that says something about the film. The film follows Samir Horn, a former U.S. operative and explosives expert playing the double-agent in an Islamic terrorist group. You've seen this film before: good guy pretends he's a bad guy in order to stop the bad guys while also running from the good guys who think he really is a bad guy. 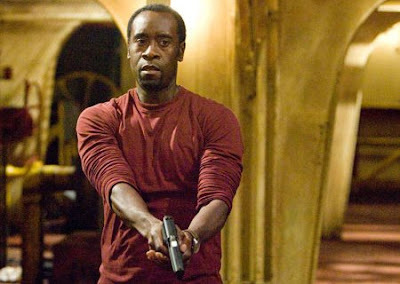 Don Cheadle gives a solid and understated performance as Horn, whose Islamic faith and brooding personality is one of the only consistencies in the film. Guy Pearce also gives a fairly good performance as a religion expert/FBI agent busy chasing Horn around the world. This is a film that had a ton of potential, but falls flat because of poor directing and a lackluster script. With guys like Cheadle and Pearce--two of my favorite actors--it could have been up there with the Bourne series as a terrific spy thriller. But the pacing is slow, the writing far too preachy, and some of the performances are just plain bad (Jeff Bridges in particular, which is sad, because he's a great actor who had a poor script). Much of the plot is far too improbable, and the "twist" at the end is an interesting but totally unlikely scenario. Director/screenwriter Jeffrey Nachmanoff could have done so much more with the film, which is co-written by Steve Martin (yeah, the Three Amigos guy). While it does raise a lot of spiritual and moral questions--especially concerning American views of Islam--Traitor is probably not worth paying $10 to see in theaters. Rent it instead.